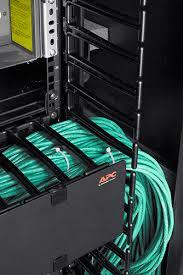 NetShelter SX Cable Management organizes large volumes of cables from networking switches and patch panels. Today’s high-density sever and networking applications demand a rack infrastructure that can mount a mix of different equipment and support high-capacity cable management in an efficient, flexible design. Space for cable routing is one of the largest problems customers encounter when installing their equipment. APC by Schneider Electric offers various cable management products, for both fiber and copper, to facilitate cable management in the front and rear of the enclosures. These products are designed for a variety of applications. Vertical Cable Management for NetShelter SX organizes and protects cables. Up to 1271 fiber or 190 Cat6a data cables can be managed with the AR7580A and cables can be secured in 1U increments. This low profile cable manager secures all cabling outside the 19" rack-mounting space and maximizes access for user-replaceable components in blade chassis. The NetShelter Horizontal Cable Management family offers cable management for network switching and server applications. Both require lots of cable and flexibility and the NetShelter SX cable management products help keep those cables organized and clean.